Spicer Orchards Cider Mill review, pics, and info. Spicer is located on Clyde Rd in Fenton and features a winery, farmers market, and several attractions that extend beyond the fall season. 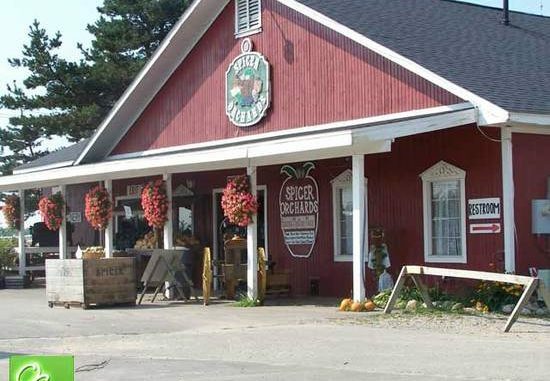 Spicer Orchards Farm Market and Cider Mill is definitely worth the drive if you’re looking for a good cider mill in Metro Detroit. I received a request to review it for the OCM Cider Mill Directory and, as promised, I wasn’t disappointed. Spicer Orchards Cider Mill is clean and has a great Fall ambiance. Spicer Orchards is not campy or “too touristy” like some local cider mills. There is plenty to explore for kids and adults so, if you plan on making a long trip like I did, I can tell you the drive is worth it. Kids will enjoy the Farm Play Area at Spicer Orchards. The Farm Play Area features a large area, petting zoo, sand box, toy tractors, tricycle trail and a wooden pirate shop to explore. The entire Farm Play Area is very well-maintained. Even the farm animal cages are clean and the animals seem very happy. Kids will also love the expansive corn mazes at Spicer Orchards. The mazes include 3 separate areas to explore with skill levels ranging from easy to difficult. The cider mill itself at Spicer Orchards features all the usual fall-fare. Cider, donuts, jellies, u-pick fruit and more. The Farm Market at Spicer Orchards is very expansive. Spicer Orchards even has a winery and cafe complete with seasonal wines and Paninis. You can watch the cider and donuts being made fresh and there is plenty of comfortable seating to enjoy an autumn afternoon. 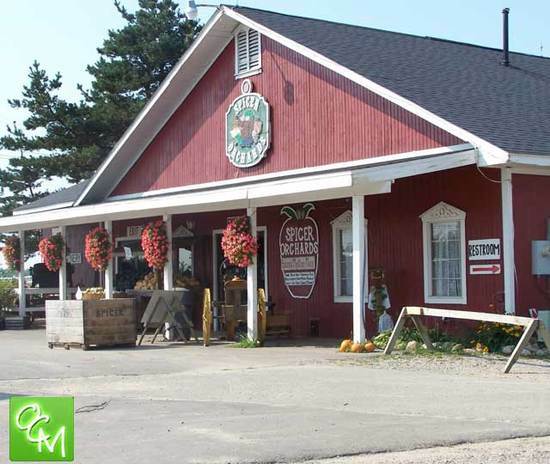 There is an overall sophistication to Spicer Orchards Cider Mill outside of the Farm Play area. I wouldn’t say elegant but, for a cider mill, it’s pretty sophisticated. Spicer Orchards and Cider Mill is what I would call a “complete” cider mill experience. They have a little bit of everything to entertain the masses. I wish they had indoor restrooms ala Westview Orchards but I’m nitpicking. Of course, the real draw at Spicer Orchards Cider Mill is the cider and donuts! The cider I tasted was tart. I loved it! I definitely prefer cider with a little bite to it over cider that is overly sweet. The donuts are huge and crisp. They’re very much like the donuts at Erwin Orchards and I only prefer the ones at Erwin Orchards by a nose. See related posts below for more cider mills reviews and pics from Macomb County, Oakland County, and Metro Detroit, Michigan cider mills.